I really loved this recipe, my husband on the other hand did not. I couldn’t get out of him what he didn’t like, but I thought it was great. I was more work than I really wanted to do that night, but the end results were worth it. 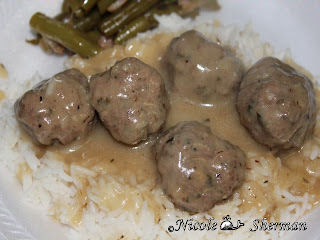 The meatballs were tender, but not mushy, and the gravy was super creamy and simply delicious! Shape into small meatballs and set aside to get your gravy started. Once the butter is melted add the onions. Sauté onion until the onions are translucent. Whisk in flour and cook until bubbly, then whisk in beef broth. This should all be done slowly to avoid lumps. Bring to a boil, and add remaining gravy seasoning. Add your meatballs to the simmering gravy. Gently place meatballs in gravy. Do not stir for at least 20 minutes (this is a must) or you will risk breaking the meatballs. After the 20 minutes are up you may begin gently stirring your gravy. Continue cooking in the gravy for another 20 minutes, and the meatballs will be thoroughly cooked. Wordless Wednesday -What a Mess! !